Every construction document for every project – available anywhere, at any time. 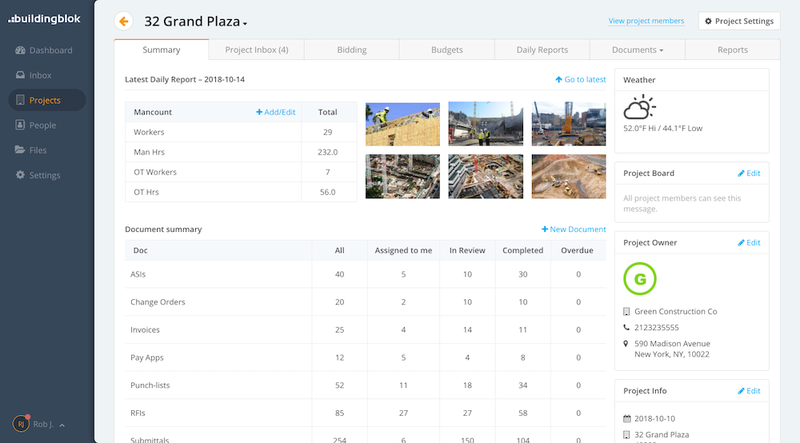 Centralize all of your construction project documents. No more sorting through papers or endless email chains. BuildingBlok stores each document for every project in one easy-to-navigate, cloud-based solution. This provides you and your teams with the visibility needed to ensure all of your projects are progressing exactly as they should. Centralize all of your construction documents so everyone can quickly access the information that they need, when they need it. Capture an audit trail of who, what, and when so nothing get lost in the shuffle. Keep everyone up-to-date with the latest project developments by capturing project activities and notes directly within BuildingBlok. Attach files to your project documents to make sure your team can easily access the most accurate information. Assign followers to specific documents so the appropriate team members are notified of changes immediately. Standardize your document workflow within BuildingBlok so you always deliver the right documents to the right people at the right time. There’s no need to enter data manually or manage invoicing via multiple systems. With BuildingBlok, you can quickly create and submit invoices for miscellaneous expenses. You can distribute information to specific individuals or an entire team – and track distributions in the memo log. Stay in control of your budgets with real time project breakdowns that tell you whether you’re over or under budget – broken down by each project.